I am deeply humbled that a full-time caregiver gave ME an hour and half of her precious free time Friday to talk about three of the greatest joys of her life: her son, caregiving and educating the world about brain injuries. As I listened to the succinct, insightful and emotional words of Jenny Carter of Dallas, Texas, I was immediately captivated by her honesty to literally tell it like it is when it comes to the five years she has been a full-time caregiver to her son, Sean, who suffered extensive injuries in a 2005 auto accident at age 22. The most serious long-term evidence of the accident has been a traumatic brain injury, which has robbed him of the ability to walk and talk and placed other limitations on his physical body. Ah, but not his mind, which is sharp and full of the same kind of witty and uproarious comments from a 20-something modern male. I know the vocabulary and style well: my own son is 28. The only difference is that Sean spouts all that with his communication board. Jenny taught me more in that 90 minutes than college students can learn in years of pursuit of a degree. What many people do not realize is that something like a brain injury or stroke is an immediate life-altering situation. "Normal" ceases in that moment. That's it. There's no cure. There is only endless hard work and an ongoing hope for continued recovery, to reclaim portions of a life lost to a cruel injury that lies hidden from our view. And nobody knows what the future will bring. Despite the initial heartbreak and daily challenges, Jenny and Sean have this amazing attitude: they live life. They absolutely refuse to wallow in self-pity and lamenting what might have been. Though she readily admits it's still an adjustment at times and there are always going to be some tough days, they've learned to move beyond the tragedy and truly appreciate life. The mom brought her three sons up to choose to be happy, and she and Sean have embraced that philosophy with even greater fervor. And it shows in their radiant smiles, their shining eyes, and how they get out into the world and refuse to hide away. Yes, they're serious about warning of the dangers of drinking and driving, but they're even more determined to not let life pass them by. My conversation with Jenny reinforces what I have learned about coping with strokes and brain injuries: attitude is 90 percent. Those survivors and caregivers who have chosen to focus on the positive, the possibilities and the gift of life itself are the ones who continuously make gains emotionally, physically and spiritually. Those who have faith and believe in something bigger than themselves also excel in everyday life and surround themselves with people they inspire and lift in unique ways. What wonderful lessons for each of us, how we attract what we radiate. Bad things happen, but we human beings have been blessed with a capability to reach within and without to touch and enrich other lives … whether we're the ones lending or accepting hands of help. What awesome powers we possess! What awesome people we can welcome into our lives! What awesome strides we can make when we give ourselves permission to live! And thank you, Jenny, for giving me one of the most precious gifts in this world: you. Sue Austin - Creating the Spectacle! This week, instead of taking a few minutes of your time reading, I'd like you to spend that time watching this video I got off Youtube. For those of you who are wheel chair dependent, you will enjoy how this person was able to take advantage of that. Sue Austin is an artist who began using a wheelchair in 1996 after an extended illness that affected her mobility. Later, when she started using it, she says she "felt an amazing sense of exhilaration at being free to speed through the streets, mobile again". However, she found that responses from other people toward her changed. She realized these responses arose from the negative preconceptions many people attach to the wheelchair. Through her art she wants to change that. "What I have stinks, but that’s what I have to deal with"
I discovered that the line of people, bundled against the chill of the February wind, was longer than I expected when I opened the church’s door. But I should have known better as the man remembered on Saturday had touched more lives than he could have ever imagined. Greg Winn lost his battle against a brutal form of Alzheimer’s far too soon. He was just a month and a half shy of his 60th birthday. Not even 60 years old. Everybody thinks Alzheimer’s is just an “old person’s” disease. It isn’t. Early onset Alzheimer’s robbed an incredibly vital man of an amazing life. Yes, 59 is young. It’s very young. I met Greg in 2006 at the Alzheimer’s support group for newly diagnosed clients and immediate caregivers. This was that magical group of folks I’ve written about before, this amazing collection of individuals who let me into their private world so that I could educate more families and the public about the wrath and pain of Alzheimer’s. At first, I didn’t understand why Greg was there. He was a kid to me. I thought at first he was the son of a parent with Alzheimer’s, but no, he was the one with Alzheimer’s, often accompanied by at least one of his devoted sisters, all in search of answers to “why?” and support. There were few answers to “why?” but there was an abundance of support. “Greg is that stereotypical perfect picture of health and vitality. He exercises regularly, eats properly, is hard-working, intelligent, generous, a dad, brother to six siblings, in his early 50s and savoring life with great enthusiasm every day. He has everything he wants and something he doesn’t want … early-onset Alzheimer’s. “Attired in running shorts and shoes, Greg prepares to lead the crowd at the annual fall Alzheimer’s Association Memory Walk. The gorgeous sky and hot sun make it more like summer than autumn, and that brings out hundreds of supporters who vow to walk for those who can’t and those who are here in spirit only. They all have a common goal: end Alzheimer’s disease. Greg told me that he had a good life working in Chicago as an accountant, never missing a day of work. Then he noticed some memory problems that were beginning to affect his work. His doctor referred him for an MRI, where the technician told him, “Take it one day at a time.” He laughs at that memory before his world flipped upside down with the diagnosis. That support system included four sisters and two brothers, who grew up in a tiny house where the girls shared one bedroom and the boys the attic. After the memory symptoms snowballed, he admits he couldn’t deal with it and moved back home to be close to family. Despite everything, he says, “I couldn’t be in a better situation.” Is it hard for him to ask for help? “It’s okay,” a female voice calls out. He smiles. Several of Greg’s siblings cheered him on from the crowd, so proud of their brother who had refused to hide from the world and who had vowed to make a difference any way he could. I can still hear and see that moment, which seems so long ago, yet was like yesterday. I was teary-eyed then and on Saturday, when I sat in the filled church for a celebration of Greg Winn’s life. While absorbing the meaning of those two very different occasions, I reflected on my own life mission as I comprehended how well Greg had accomplished his. He put a real face on Alzheimer’s and it’s brutal toll and worked so hard to draw more attention to it. And I was so blessed to know him and help tell his story in my book. I also realized that I had accepted a calling that would lead to more moments like this, falling in love with so many individuals who would lose their battle against Alzheimer’s. I have and will shed many tears and suffer heartache at loss, but I wouldn’t change what I want AND need to do. I’ve also lost stroke, cancer, traumatic brain injury and brain tumor-brain cancer survivors who had won special places in my heart as I’ve allowed their stories to become part of me. You won the race, Greg! 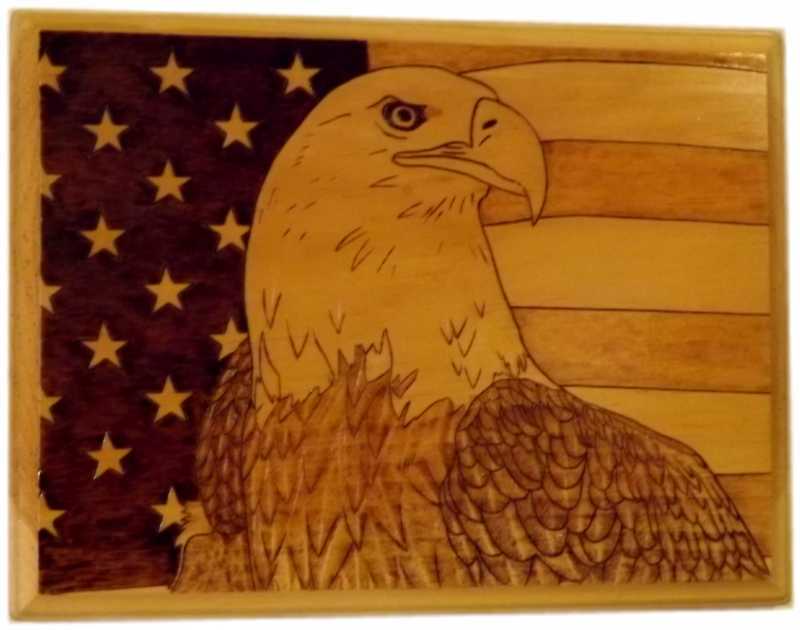 As one of this year's fund raisers, Stroke Camp is thrilled to raffle off chances to win one of three beautiful intarsia wood carvings made by stroke caregiver Rob Herb from Cheyenne, WY. First place is an American Eagle intarsia. 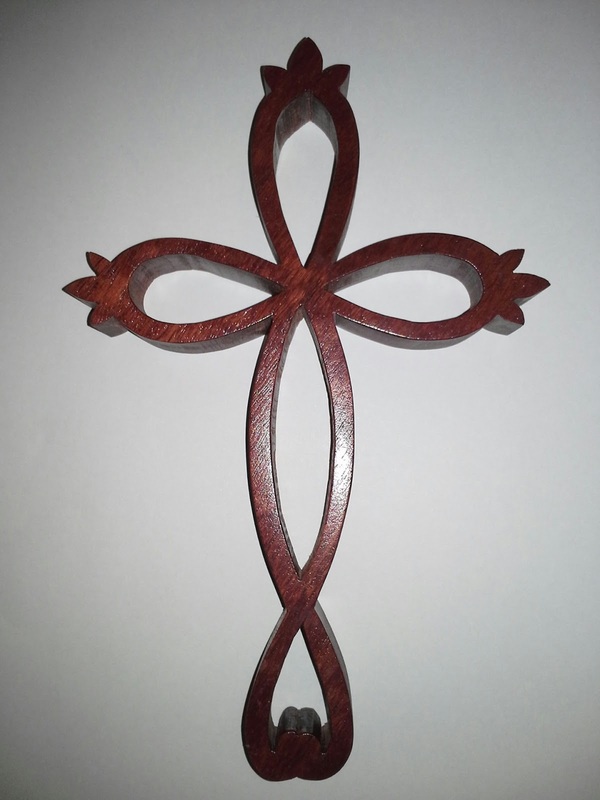 Rob spent countless hours creating this wood carving from different types of wood imported from all over the world. Rob also made a second place praying hands intarsia and a third place wood burned eagle plaque. I've included pictures of the three below. or by mailing a check to 425 W. Giles Lane Peoria, Illinois 61614. Please include a memo with the check stating that it is for the raffle tickets. We will mail you your ticket stubs so be sure your name and address are included. Ticket prices are: 1 ticket for $5, 3 tickets for $10, and 7 tickets for $20. All proceeds go to fund Retreat & Refresh Stroke Camp. The winner will be drawn on November 9, 2013. Don't know what intarsia is? Following is a definition taken in part from Wikipedia, the free online encyclopedia. Following the definition is the "back story" on how Rob got involved in doing intarsias and why these particular ones have such special meaning to him, his family and now, us. I've included, within Rob's story, photos of the actual carvings being raffled by us. Intarsia is a form of wood inlaying. Inlay is a decorative technique of inserting pieces of contrasting, often colored materials into depressions in a base object to form patterns or pictures that normally are flush with the matrix. In a wood matrix, inlays commonly use wood veneers. In woodworking, veneer refers to thin slices of wood, usually thinner than 3 mm (1/8 inch), that typically are glued onto core panels typically, wood. It is thought that the word 'intarsia' is derived from the Latin word 'interserere' which means "to insert". Intarsia is a woodworking technique that uses varied shapes, sizes, and species of wood fitted together to create a mosaic-like picture with an illusion of depth. 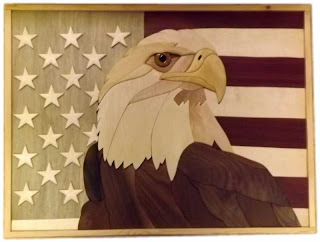 Intarsia is created through the selection of different types of wood, using their natural grain pattern and color (but can involve the use of stains and dyes) to create variations in the pattern. After selecting the specific woods to be used within the pattern, each piece is then individually cut, shaped, and finished. Sometimes areas of the pattern are raised to create more depth. Once the individual pieces are complete, they are fitted together like a jig-saw puzzle and glued to wood backing which is sometimes cut to the outline shape of the image. In April 1999, we were searching for our older daughter's godmother, whose 1st husband (Don Dwiggins) was killed in Vietnam and with whom we had lost contact. After some searching and emailing, we found Lynn Dwiggins Honeycutt [& had lots of tears] and convinced her to attend our 35th reunion in 2002. BTW, the phone call with Lynn occurred on the 14th of April, 1999, Judy's 55th birthday. That was one heck of a birthday present. FYI, I told Boyd that Don Dwiggins was with the 25th Infantry Division when he was KIA, so I have a special bond with anyone who served with the "Tropic Lightning" Division. Our 2nd granddaughter was born in June 1999 with some medical problems & was medevaced to Houston, so we asked Dr. Tom Parr, a 1967 USMA grad & orthopedic surgeon living in Houston, to explain some of the medical jargon for us. Also, Tom and his wife were the ones who ultimately got us reconnected with Lynn Honeycutt because Tom was working on Don's Memorial Article for the Assembly Magazine. Rob made his 1st burning of his class crest in 2001 for Tom in thanks; when we realized how much he appreciated it, it got us thinking about making them for Surviving Family Members (SFMs) of classmates who died since we graduated in 1967. The first presentations were done in November 2002 at our 35th Reunion, and we've been doing them ever since then. Lynn is now the class representative for our Surviving Family Member group. In Honor of Donald H. Dwiggins, Jr.
After presenting Tom with the Class Crest at the Ski Reunion in Breckenridge, CO, we contemplated how we could 'honor' Donald H. Dwiggins, Jr.'s death. 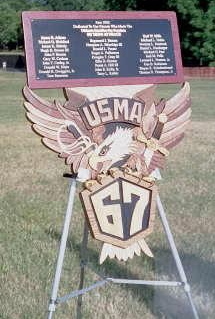 In February 2001, we decided to make the first-ever [for us] intarsia of the class crest with the names of my 29 classmates who were killed in Vietnam inscribed above the crest (see attached photo). It took both of us about 16 months to make, from scratch, with mostly hand-sanding and a small belt sander. This is the first piece where purple heart wood (the backing for the inscription) was used to honor my classmates who were wounded or killed in Vietnam. Although the feathers on the eagle's wings seem to be mismatched, we tried to incorporate as many different woods as possible to signify the diverse backgrounds of the members of the Class of '67. It was dedicated at The Wall at a Memorial Service in June 2002 and is displayed in the South Conference Room of Herbert Hall, the Alumni building at West Point. All of our intarsias are made of natural woods with no stains applied. Since that first one, we have tried to incorporate some blood wood or redheart to remember the blood that has been shed by our men and women in uniform to keep our Great Nation free, some white or black ash to signify the Common Book of Prayer's graveside rights reference to 'ashes to ashes' and dust to dust, and purple heart wood to honor those who have been wounded or killed in battle. 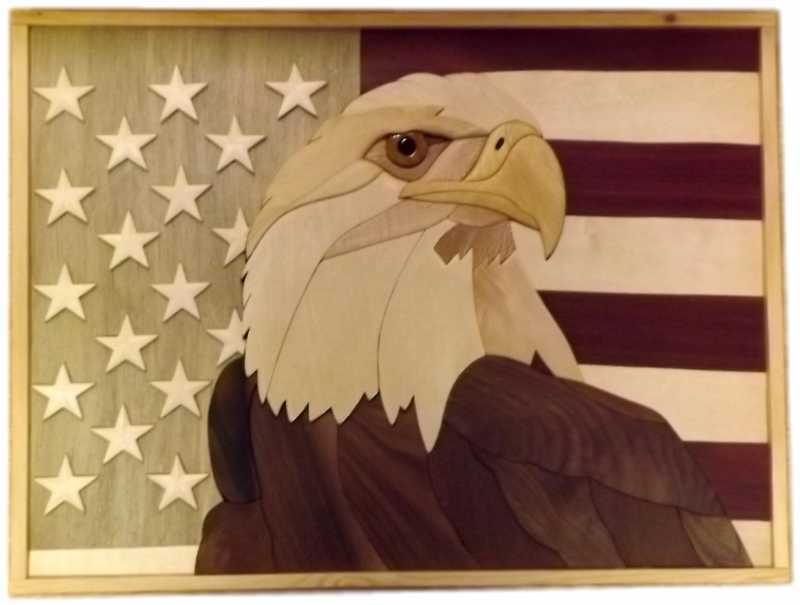 The Eagle & Flag intarsia pattern is one that Judy adapted from a calendar picture we've had for 10 years. 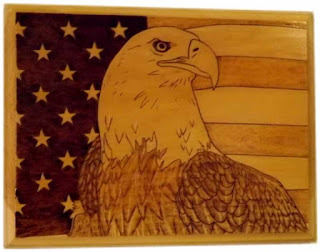 This is a wood burning of the Intarsia pictured above. The Praying Hands is a pattern that we found in one of my woodworking/intarsia books. Judy has one similar to the one you'll be raffling (slightly modified) hanging in our living room. 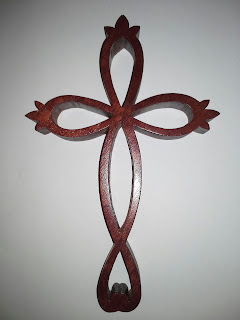 As for the crosses that we've made, that's something that evolved from the care that Judy received after her stroke in 2004. The medical professionals we've come in contact with since her stroke are truly a gift from God. I started making them around 2005 after I got some patterns from one of my Masonic friends. I think the first one I made was for Judy's Occupational Therapist who was determined to find a way to get Judy's right hand functioning again. Since then, we've been providing them to the good people who continue to cross our path and give us hope for the future. If you need any more info, please let us know.